As reported Monday 12th Aug by The GCB, this is entirely not the case, they have had the damning reports all along that proved all of this, it is information in their hands but they have completely suppressed all of it - not only from the public, but from the bidding consortia and from the councillors as well according to some sitting councillors responding today. 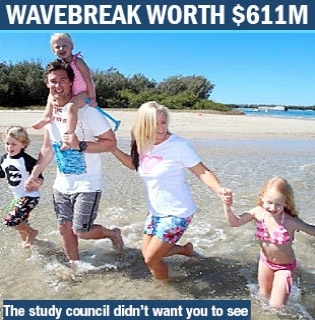 The reports also show the CST would be lucky to generate $15 - $30 million a year for the city, well and truly below the current economic benefits from surfing, diving, day tourists, visitors, fishing, boating, events and many other drawcards, that the area brings in annually. The damning evidence is an indicator of the possible depths of misconduct, and severe lack of transparency being utilised in order to deceive the people of the Gold Coast and essentially sell them a lie, that lie being that this project will bring about wondrous financial gains to all of us in the city and that the project can coexist with the environment, provide better access to recreation and dramatically increase job opportunities. IT'S ALL FALSE and the people of the Gold Coast have been totally scammed it would seem. The expert scientists and researchers were commissioned under an explicit agreement that their efforts and research would be made public for the benefit of our city, but they were also deceived with nothing of the sort occurring. What has been up until now one of the greatest land heists ever attempted in Queensland, is finally being exposed. It's clearer now more than ever that no matter what your view on the proposed cruise terminal is, whether you think it's great or terrible, that you have deliberately been misinformed and kept in the dark by those that seek to give away YOUR land for free, for the sole benefit of a wealthy minority that don't have your interests at heart, at all. Any councillor that supports the current project in light of these reports would now directly defying the best interests of our city, and must be made accountable throughout the remainder of their term and at the next council election. Contact your councillor today (it's a must do!) and let them know what you think. It's vital that they held accountable for their actions, or inaction, from this point on. Support the councillors that support the people on this one also of course. UPDATE: Multiple councillors have today defended themselves stating that they have had no knowledge of the reports and have never seen them. It would seem that they have been deceived as much as the residents on this issue. It's vital that they seek out and study these reports in detail before making any single new decision on the project, please let them know you're thoughts!